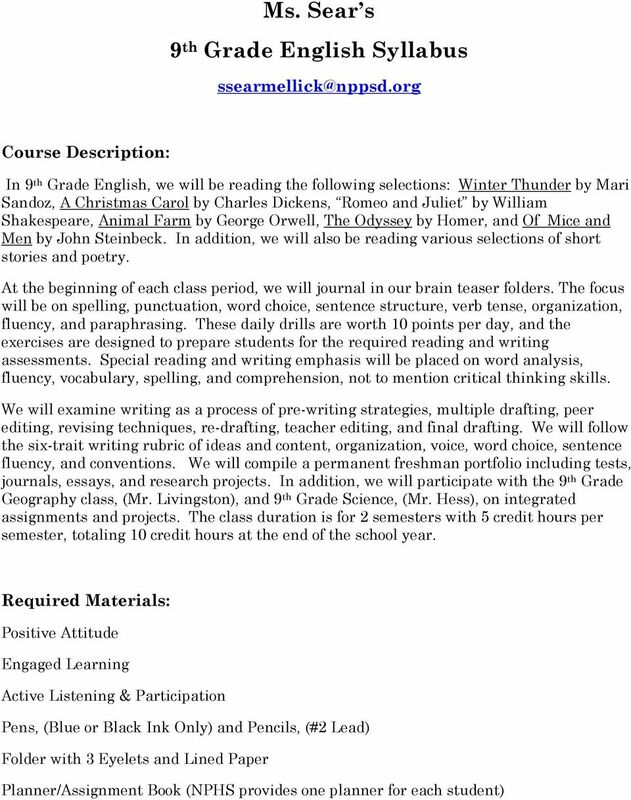 Download "Ms. Sear s 9 th Grade English Syllabus"
2 Expectations: Please note that book bags, I-Pods, MP3 players, and cell phones are not on the required material s list! During class time, all students will turn cell phone ringers off; all students will refrain from text messaging in English class. If this basic boundary is not respected, cell phones, MP3 Players, or I-Pods will be confiscated, and the student will have to meet with Ms. Sear after school to obtain his/her personal property. Upon a student s third offense, the cell phone, MP3 Player, or I-Pod will be taken to the office, and a parent or guardian will have to pick the personal property up after school. As for book bags, we simply do not have the space in the 1405 classroom for 20 to 30 book bags. Please use your lockers to hold all supplies for your other classes, and use your transition time wisely so that you are prepared for each period. Arrive for class on time and with all necessary supplies! Students will be in their assigned seats, (before the tardy bell rings), with all required materials. If a student is tardy for class, he/she will have to make up the time after school. Situations do occasionally arise when a student cannot avoid being late for class, but in order to avoid detention, the student will present a legitimate pass to Ms. Sear. As for dismissal, remember the bell does not dismiss you, Ms. Sear dismisses you. Students are to remain in assigned seats until the bell rings; standing at the doorway or in the hallway is not acceptable. Students will use transition/passing time for bathroom breaks. Students will not ask for permission to leave the classroom. Please understand that this disrupts the learning environment for all involved. If a student absolutely has to use the restroom, please wait until Ms. Sear has finished with instruction, which is at least midway into the class period. Permission to go to the bathroom is a privilege not an absolute right, and students will earn this privilege through positive, consistent efforts in class. Students are expected to attend to personal matters before school, during passing periods, at lunch time, and after school. Students will be granted restroom, locker, or drink privileges by checking with Ms. Sear, and by signing out on the clipboard by the door. Only one student is allowed to leave the classroom at a time. Students will maintain a clean and orderly classroom and learning center. Students will demonstrate total respect for school property at all times. Food, drink, and gum are not allowed in the classroom or in the computer work area at any time. Students will demonstrate absolute respect, trust, and consideration for self, peers, teachers, paraeducators, substitute teachers, student teachers, administration, maintenance workers, and office staff at all times. School property and personal property of peers will be treated with ultimate respect. Students will be charged the replacement cost of any damaged school property or missing books. Students will check out all books through Ms. Sear, and students will return the books directly to Ms. Sear upon completion of the unit. 3 Homework/Grading: Grades are based on the standard school system. We will be doing most all work in the classroom. Occasionally, homework will be necessary. Cheating and plagiarism will not be tolerated! If a student willingly gives homework or test answers to another student, both students will not receive credit for the lesson or test. Students are expected to use the daily planners to record assignments and test dates. Students are also expected to use the 9 th grade blog spot to access missing or make-up work. The blog is a crucial tool for your success as a freshman; to access the blog spot the site can be located at np9thgraders.wordpress.com. In most cases, students are capable of handing in all work on time. If a student is absent, it is the student s responsibility to visit with Ms Sear about the make-up work; this visit needs to be before or after school, not during class time. 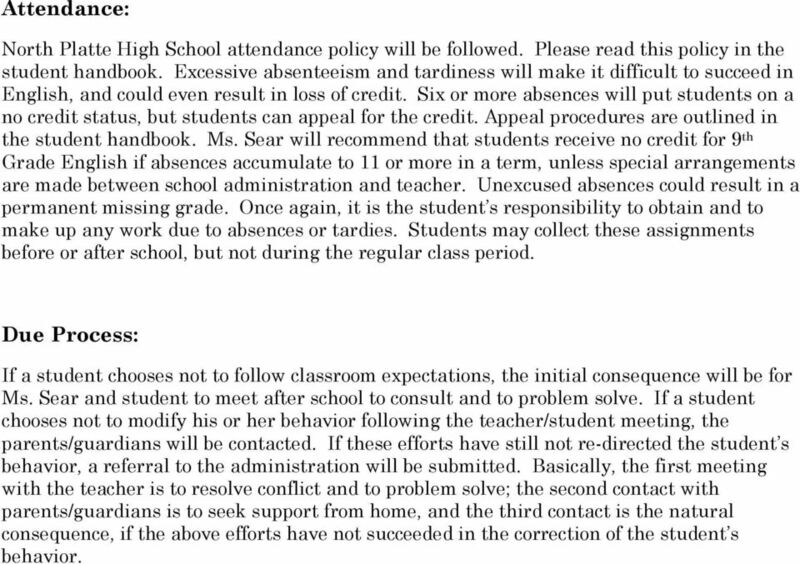 Absent students will be allowed the number of days absent, plus 1 additional day for each absent day, to complete make-up work, with no points deducted. Late work policy is that each student has the allowance of 3 late assignments, per semester, without penalty. 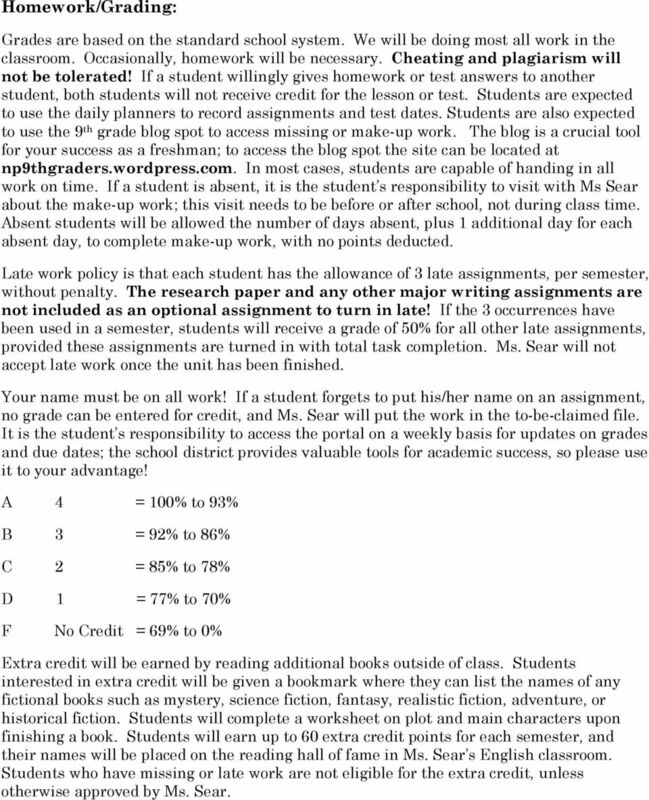 The research paper and any other major writing assignments are not included as an optional assignment to turn in late! If the 3 occurrences have been used in a semester, students will receive a grade of 50% for all other late assignments, provided these assignments are turned in with total task completion. Ms. Sear will not accept late work once the unit has been finished. Your name must be on all work! 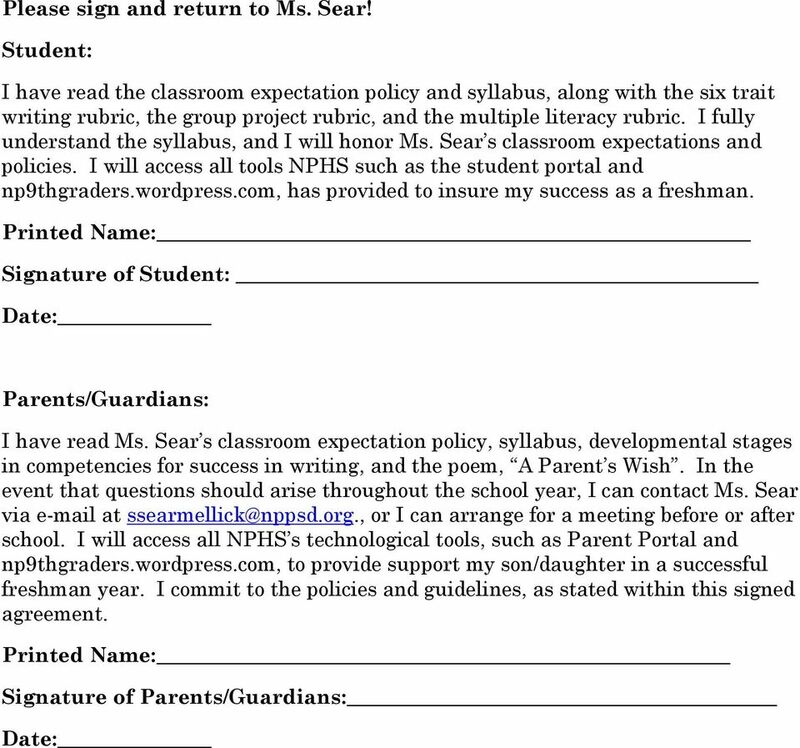 If a student forgets to put his/her name on an assignment, no grade can be entered for credit, and Ms. Sear will put the work in the to-be-claimed file. It is the student s responsibility to access the portal on a weekly basis for updates on grades and due dates; the school district provides valuable tools for academic success, so please use it to your advantage! A 4 = 100% to 93% B 3 = 92% to 86% C 2 = 85% to 78% D 1 = 77% to 70% F No Credit = 69% to 0% Extra credit will be earned by reading additional books outside of class. Students interested in extra credit will be given a bookmark where they can list the names of any fictional books such as mystery, science fiction, fantasy, realistic fiction, adventure, or historical fiction. Students will complete a worksheet on plot and main characters upon finishing a book. Students will earn up to 60 extra credit points for each semester, and their names will be placed on the reading hall of fame in Ms. Sear s English classroom. Students who have missing or late work are not eligible for the extra credit, unless otherwise approved by Ms. Sear. 4 Attendance: North Platte High School attendance policy will be followed. Please read this policy in the student handbook. Excessive absenteeism and tardiness will make it difficult to succeed in English, and could even result in loss of credit. Six or more absences will put students on a no credit status, but students can appeal for the credit. Appeal procedures are outlined in the student handbook. Ms. Sear will recommend that students receive no credit for 9 th Grade English if absences accumulate to 11 or more in a term, unless special arrangements are made between school administration and teacher. Unexcused absences could result in a permanent missing grade. Once again, it is the student s responsibility to obtain and to make up any work due to absences or tardies. Students may collect these assignments before or after school, but not during the regular class period. Due Process: If a student chooses not to follow classroom expectations, the initial consequence will be for Ms. Sear and student to meet after school to consult and to problem solve. If a student chooses not to modify his or her behavior following the teacher/student meeting, the parents/guardians will be contacted. If these efforts have still not re-directed the student s behavior, a referral to the administration will be submitted. Basically, the first meeting with the teacher is to resolve conflict and to problem solve; the second contact with parents/guardians is to seek support from home, and the third contact is the natural consequence, if the above efforts have not succeeded in the correction of the student s behavior. 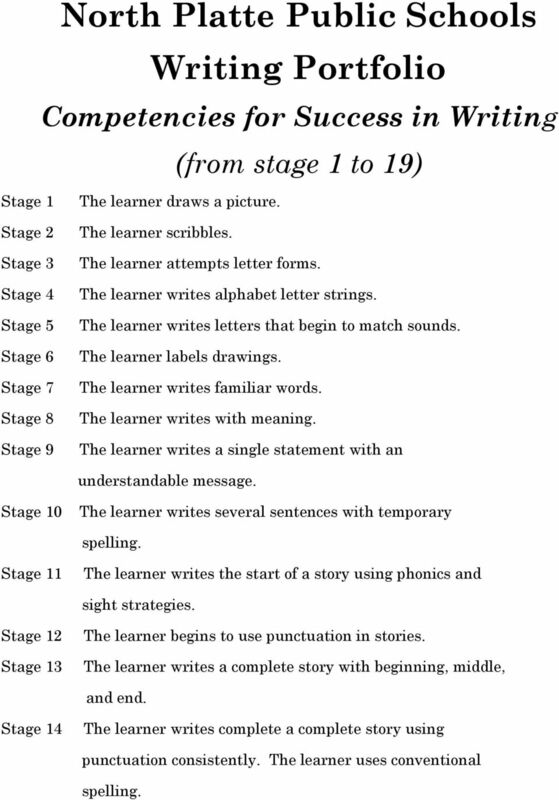 5 North Platte Public Schools Writing Portfolio Competencies for Success in Writing (from stage 1 to 19) Stage 1 The learner draws a picture. Stage 2 Stage 3 Stage 4 Stage 5 Stage 6 Stage 7 Stage 8 Stage 9 The learner scribbles. The learner attempts letter forms. The learner writes alphabet letter strings. The learner writes letters that begin to match sounds. The learner labels drawings. The learner writes familiar words. The learner writes with meaning. The learner writes a single statement with an understandable message. Stage 10 The learner writes several sentences with temporary spelling. Stage 11 The learner writes the start of a story using phonics and sight strategies. Stage 12 Stage 13 The learner begins to use punctuation in stories. The learner writes a complete story with beginning, middle, and end. Stage 14 The learner writes complete a complete story using punctuation consistently. The learner uses conventional spelling. 6 Stage 15 The learner self-initiates writing. The learner writes for a variety of purposes. The learner writes following a pattern in a story or poem. Stage 16 The learner adds detail to writing such as dialogue, humor, and emotion. The learner revises and edits with direction. Stage 17 The learner writes with creativity and imagination. The learner writes original poetry. The learner writes a clear, sensible message. The learner masters correct punctuation in revised copies. Stage 18 The learner uses a variety of writing genre such as mystery, humor, and content writing. Stage 19 The learner completes all stages of the writing process. 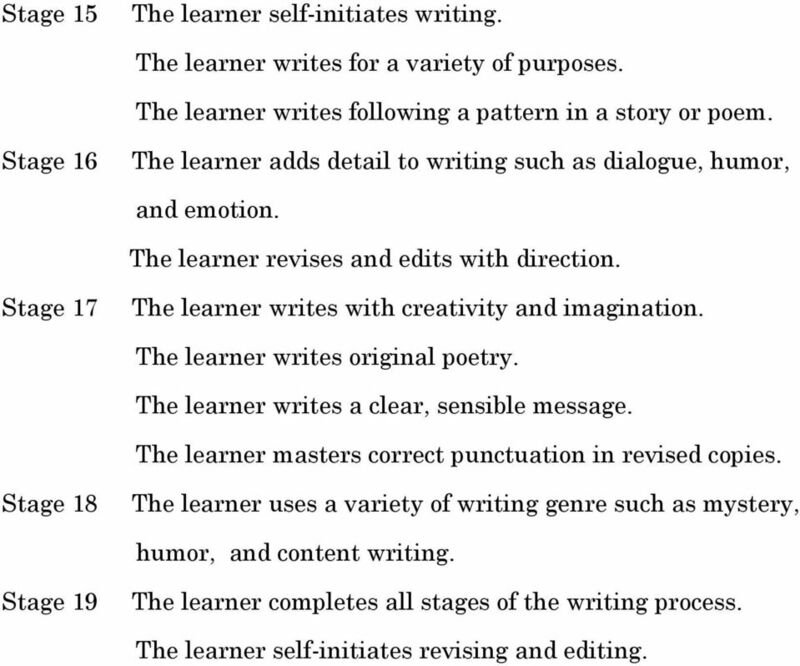 The learner self-initiates revising and editing. Attendance Policy. Aims This attendance policy is designed to foster a culture of learning in the School. Attendance Policy Rationale The School recognises the importance of regular attendance of pupils. This policy aims to ensure the best possible pupil attendance to follow up procedures for pupil absence.